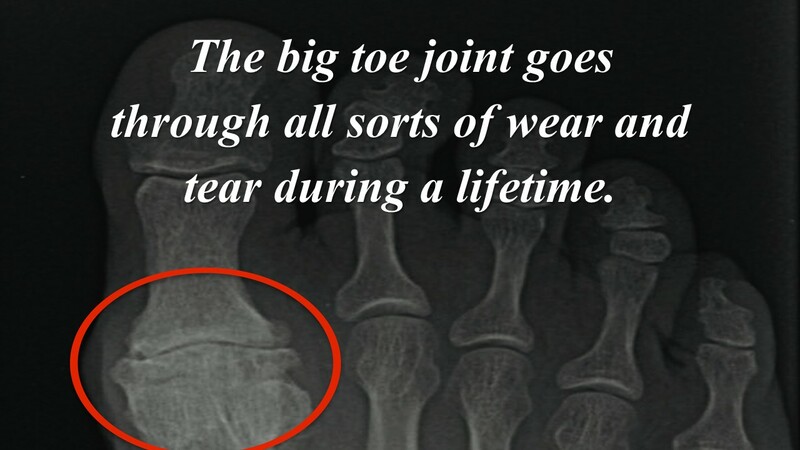 The big toe joint goes through all sorts of wear and tear during a lifetime. In addition to simply having to constantly bend while you walk, it also is affected by the shoes you wear, your weight, your natural foot structure, as well as whether you have ever had any injuries to the toe area. Over time, all of these factors can lead to degenerative changes to the joint at the toe base. Arthritis of the big toe joint can be mild or severe, and can be painless or painful no matter what stage the arthritis is in. We have seen terrible arthritis that did not cause a day of pain, and we have seen minimal joint wear that was causing excruciating pain with every step. The typical painful big toe joint has some form of bone spur on top limiting upward motion, as well as some degree of loss of cartilage, the material that allows the two bones in the joint to smoothly move over each other. Without cartilage, the bone ends grind on each other, causing further destruction to the joint. As the big toe joint becomes more arthritic, it will bend less and be more and more painful when one tries to bend it upward while walking, stooping, or squatting. The joint movement can feel crunchy, and the skin around the joint can even swell a little. This destructive change is permanent, and the damage can continue to increase over time. Fortunately, we have many treatment options for this condition, depending on the severity. These include support measures, techniques to reduce the painful inflammation, as well as corrective options to fix the arthritis for good. The podiatrists at Indiana Podiatry Group are highly experienced in treating big toe joint arthritis, and we can offer a highly successful treatment for this condition. If your big toe joint is starting to hurt, give us a call. Early intervention can make a big difference.